There is something irresistible about things in little wooden boxes. A friend lent me this old Camera Lucida to play around with. It’s an amazing device that allows one eye to see an inverted image of what ever is infront of you while the other eye sees your sketch book. 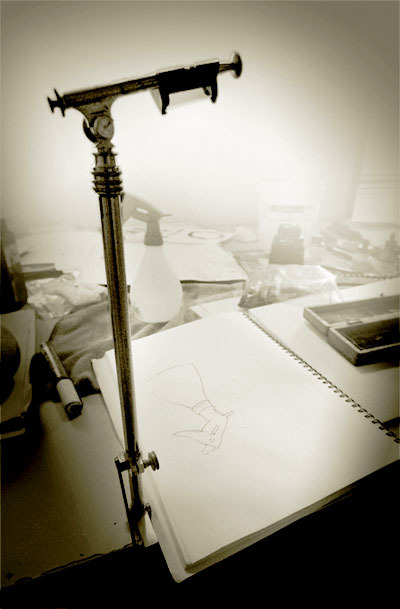 Once the device is set up it is a simple matter to trace what ever you are looking at onto the sketch book. 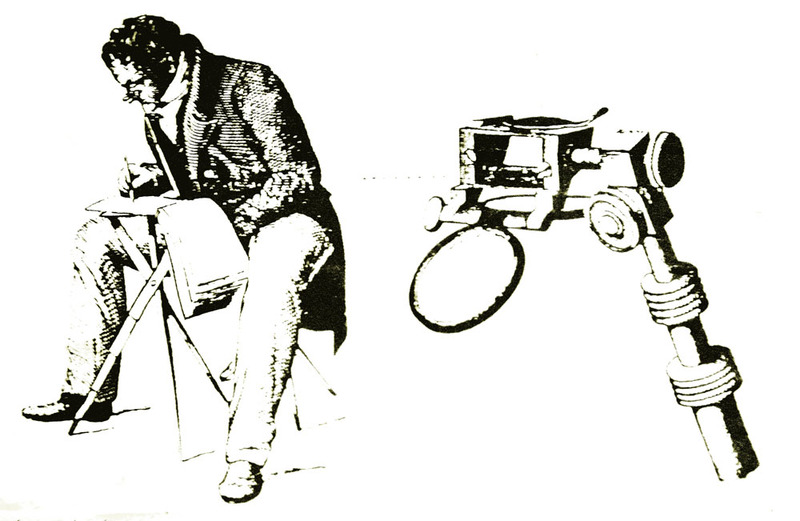 The device was patented by William Hyde Wollaston in 1806 and was used as an aid to to sketching and visual documentation prior to the development of the camera. The device is difficult to set up and the results have a tight, traced look about them. The camera lucida is beautifully made from heavy polished brass. The solid brass base clamp is hand engraved in French with the manufactures details. The wooden box has fine dovetailed joints and is lined with felt and satin. What a nice thing to carry around when you go sketching! Today, the common pose of someone taking a photograph is two arms outstretched, camera gripped at arms length. This replaced the camera pushed to face, squint through viewfinder pose created by the invention of roll film. I wonder if the pose above, with the camera lucida and folding stool, was a common site through the 1800’s? This entry was posted in Art Materials, Photography, Weird and tagged Art Materials, camera lucida, drawing, Photography, sketches by splashingpaint. Bookmark the permalink. I am envious you got a hold of a camera lucida. I am reading Secret Knowledge by David Hockney at the moment, he discusses various optics old masters may have used. The camera lucida is covered at length which makes me very curious about how optics really work in this device. Pictures in the book are great, but cannot compare to hands-on experiments. Thank you for posting detailed photos. I also want to take a moment to thank you for your great blog and especially your tutorials. I am visiting often to read and to study. I don’t know if it is mentioned in the David Hockney book, but the original camera lucida made by Wollaston was simply a piece of bent wire with a half silvered prism attached with wax. I imagine it would have been just as effective as the beautiful brass device it led to!